At Active Design Miami (ADM) we love, and we mean LOVE, trees. Walk outdoors on a hot, humid South Florida day and you’ll be begging for the shade of treelined streets and sidewalks. Unfortunately, Miami-Dade’s shade percentage stands at a mere 14 percent, when a healthy urban forest should be 30 percent. This lack of tree canopy can lead to reduced levels of outdoor activity, including biking, running and walking, and even become of barrier to accessing public transportation. Trees, though, are important for more than just keeping us cool. Trees also provide environmental, social and economic benefits to communities including: combating climate change by absorbing CO2 and saving energy by cooling our homes; reducing violence by helping to reduce level of fear; and increasing property values and creating economic opportunities. 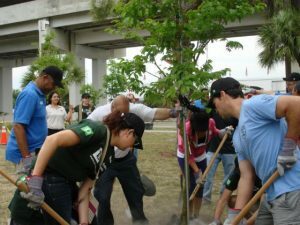 Furthermore, tree plantings and urban forestry programs are increasingly being utilized not only for aesthetic and environmental reasons but also to provide health benefits to communities. Lead by the University of Miami Department of Public Health Sciences, a new study of Miami-Dade County Medicare beneficiaries showed that higher level of greenness on their neighborhood block were linked to a significant reduction in the rate of chronic illnesses and health conditions like diabetes, hypertension and high cholesterol, particularly in low-to-middle income neighborhoods. In fact, residents living in greener areas is associated with better health outcomes by reducing stress, air pollution, humidity and heat island effect; encouraging physical activity, social interaction and community cohesion. 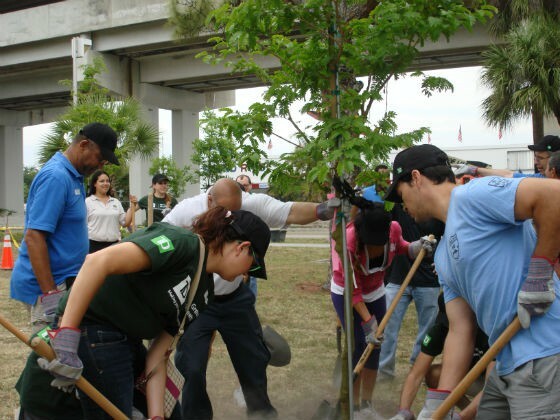 Through programs like Million Trees Miami, Miami-Dade County and its partners have the goal of achieving a minimum of 30 percent tree canopy coverage by 2020, along with aiming to achieve the maximum social, economic, and environmental benefits to the region. Active Design Miami strategies support Miami-Dade County and its municipalities in seeking to enhance its tree canopy in order to create a healthier, more livable, walkable and pleasant environment.